Snow Day = Cookie Day! Snowmageddon keeps hitting St. Louis. Over and over. What to do when it looks like a small mess of people might be trapped in your house? Get them all sugared up and then it will seem at least a little bit more fun than getting stuck in a paper bag. My first stop- allrecipes.com, my go-to site for all things baking and cooking… especially when I don’t know what I am doing. 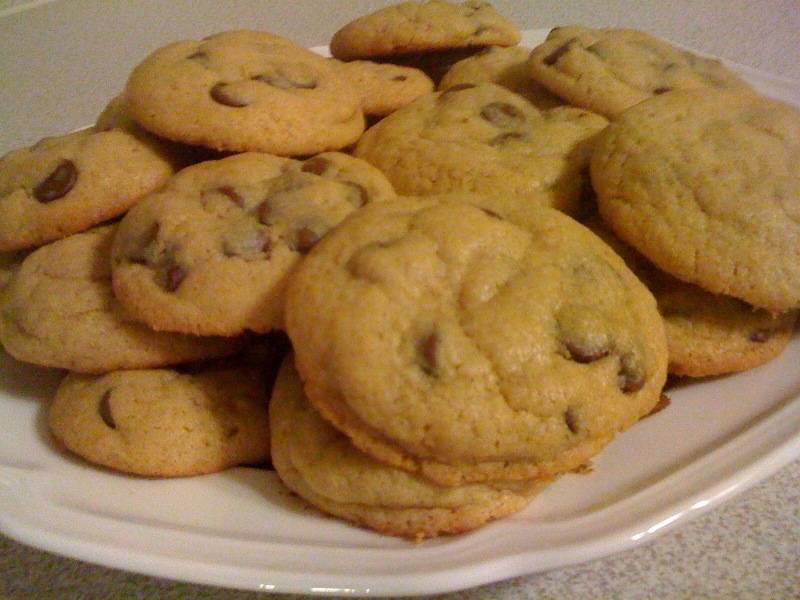 This was my first time making chocolate chip cookies, and I stumbled across a recipe that called for adding a package of vanilla pudding to the cookies. I didn’t have vanilla, but I *did* have cheesecake flavored pudding and white chocolate flavored pudding hanging out in the cabinet. My very pregnant best friend, who was staying a few nights during a trip to St. Louis, voted for the cheesecake pudding. In her words, “Either one will be good, but if you try the cheesecake you may have something amazing.” Trust the pregnant lady when it comes to sweet inventions… she is, after all, the one dipping everything in your fridge in a tub of leftover chocolate icing (true story). Sugar rushes make everything seem more fun. Preheat oven to 375 degrees F (190 degrees C). In a mixing bowl, cream butter and sugars. Add pudding mix, eggs, vanilla and milk. Combine flour and baking soda. Add to creamed mixture and mix well. Fold in chocolate chips. Drop by teaspoonfuls onto ungreased baking sheets. Bake for 10 to 12 minutes or until lightly browned.